As of July 1, when getting licensed Class A and B contractors in Virginia will have the option to post a $50,000 Virginia contractor bond instead of satisfying the minimum net worth requirements in the current Virginia law. The recently passed bill also specifies the conditions under which the bond agreement will operate and how and when claims can be made against the bond. It also defines the ways in which contractors can provide proof of minimum net worth. Read on for an overview of the new Virginia contractor bonding requirements. Class C contractors are those who have contracts that are lower than those of Class B, and are not affected by the new legislation. This requirement is now amended with the changes introduced by the recently passed bill. According to Senate Bill 1113, Virginia Class A and B contractors may now post a Virginia contractor license bond in the amount of $50,000 instead of having to maintain a minimum net worth. That option offers important relief to license applicants because it reduces the financial burden placed on them by previous legislation. By posting a surety bond instead of maintaining net worth in such high amounts, contractors can make use of that capital for their business. If contractors opt to maintain minimum net worth, the new Bill also specifies what kind of proof thereof they may present. Accordingly, both Class A and B contractors must provide proof of minimum net worth to the Virginia Board of Contractors in the form of a financial statement on a form provided by the Board or a balance sheet reviewed by a certified public accountant. Those contractors who decide to obtain a Virginia contractor bond are also required to renew their bond every time they renew their license. A contractor bond usually has the same expiry date as a license and must begin no later than the license renewal date. Obtaining a contractor bond costs only a fraction of the full bond amount. How much exactly a contractor will be required to pay for their surety bond is determined on an individual basis but standard rates for contractor bonds can be as little as 1% of the total amount of the Virginia contractor bond. The cost of a surety bond is determined by sureties on the basis of an applicant’s financial status. Their personal credit score is among the most important indicators that sureties review when determining the rate at which to issue the bond, but financial statements and assets are also commonly taken into account. To get a free and precise quote on your contractor license bond, click on the banner below and complete the surety bond application. I appreciate that this article shares an option other than the minimum net worth requirement, but also why that option can be beneficial, freeing up capital for business use. 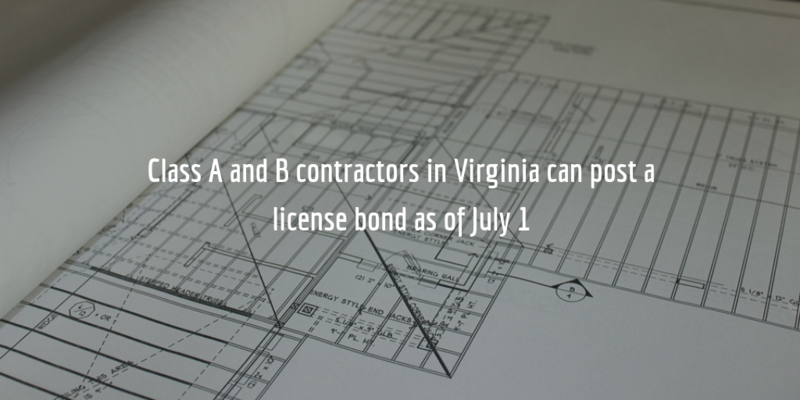 Another benefit of posting the contractor bond is that it can streamline the Virginia contractor licensing process for license candidates. Our instructors have worked with thousands of contractors, preparing them to pass the PSI exams. Many of the new DPOR regulation changes have slowed down the licensing approval process to a turtle’s pace. We’ve worked with students where DPOR has taken three months, six months, or with one student, nearly a year to approve him to sit for a specialty exam due to verifying his financials. We’ve recommended to a number of our students to simplify the process by posting a bond since July 1, 2017. For many of them, we’ve seen the approval process shorten dramatically.